We met in Egypt. And had four days together. He made me laugh, something clicked and there was that spark. We talked about me visiting him in Milan but as a teacher it had to be the school holidays and it seemed way too long off. We exchanged details and said goodbye. Back home I decided to go with my gut instinct. I rang him a few weeks later. Very happy to hear from me, he asked when I was going to visit. I responded with my flight details for my arrival at Lineate Airport four months later. We had twelve wonderful days in Italy. After that there was no looking back. The remainder of the year was a romance of long distance calls and then he returned to his hometown Melbourne. We spent the summer holidays together and then I returned to Whyalla to teach and he stayed in Melbourne to work. Then one day he flew on two planes to Whyalla and proposed and flew back the next morning. Six months later in January we travelled to Italy to live. He thought it would be a good idea to escape the cold Italian winter before settling in. I liked the idea of a nice Thai beach somewhere. Well I got the sand and the T stuck too. Translated, the Sahara Desert and Timbuktu. North West Africa was not my idea of a holiday but it was an adventure, like I had never experienced. We bumped around Algeria, Niger, Mali, Senegal and The Gambia for three months. And yes, we got to Timbuktu. Everest Base Camp was just another remote place not on my travel plan. However, this adventure required a certain level of fitness and training. And so, my husband became The Trainer. The Trainer designed our training plan, cajoled, encouraged, and nagged to keep me on track to make sure we would make our EBC trek in the best condition and without aches and pains. 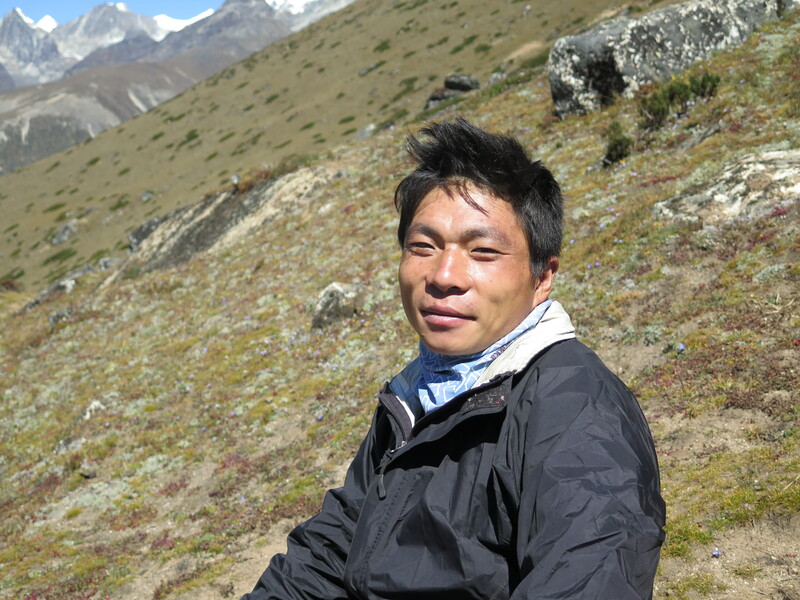 He was the trek researcher, designer and organiser, packing mastermind and photographer. If it wasn’t for the Trainer I would not have been to this amazing part of the world and had this wonderful experience. One friend said to me, “You’d follow him anywhere.” She’s right, I probably would. To my Valentine Trainer … the best is yet to come. The trainer was very excited about finally seeing the marathon runners who had started early that morning from Everest Base Camp running past, all of us on our way to Namche Bazaar. The event was originally in May but was rescheduled to the beginning of October after the earthquakes. We left our lodge at Pangboche as doctors prepared the medical check point and lodge staff the water bottles. The following photos show the track. 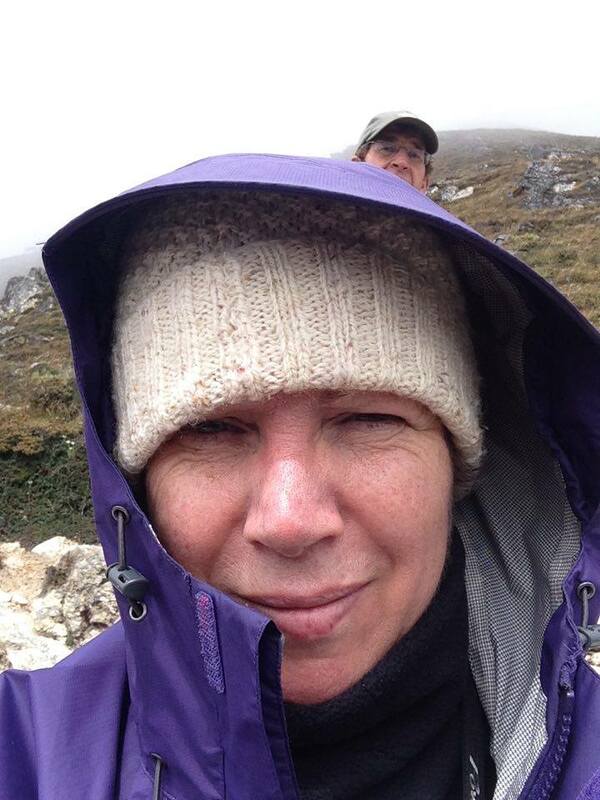 The steep uphill climb (600m) had nearly killed me on our 2013 trek. Coming back down isn’t easy either. It can impact on your knees which is why I chose to use trekking poles. The steep track with lots of small loose rocks can be slippery so the only way to go is slowly. That’s me picking my way down with the trekking poles. The view of Namche Bazaar from above. I had my sights set on the red roofed lodge in the middle, right …. which for me meant our favourite lodge, our own bathroom and a hot shower at last. 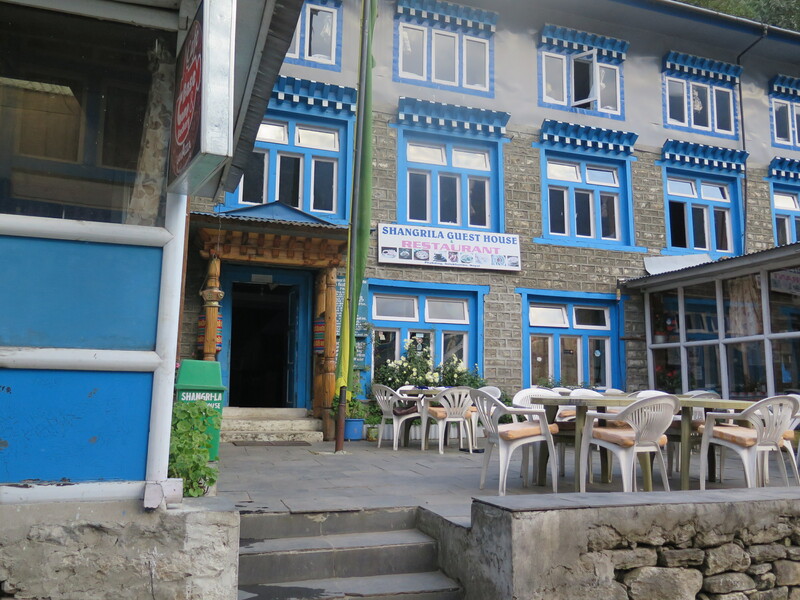 We had a drink at Café Danphe Bar to celebrate our successful, wonderful trek to Everest Base Camp. Huddled together in the bar we looked at all the photos Sam had taken. For the best of an hour I sat with tears streaming down my face, hardly able to believe the photos of the magical places we had just been.